Even the most seasoned teachers have encountered a class they just can’t reign in. If you’re currently facing a troublesome group of students, don’t give up hope. 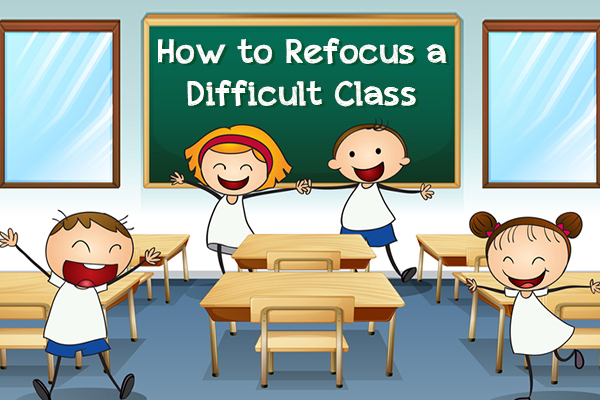 Here are five simple methods for taking back control of your classroom, while still maintaining your sanity and professionalism. There are various school support personnel in every school district and many of them can provide you with valuable feedback. From guidance counselors to school psychologists and social workers, there is usually someone who could offer advice on how to work with a specific student, or suggest methods that work with a particular issue. Also, you may not be the only one dealing with these issues. Talk to other teachers who may teach the same students as you to see what strategies they use that work. Parents and guardians are part of the support systems too. The best phone call you make will be to parents and guardians. Communication with parents is the most effective method for eliminating bad behavior in the classroom. Make phone calls whenever necessary, and remember to call parents back when the behavior improves. You’re more likely to get them on your side if you take time to note the positive. It’s tempting to scream,“If this doesn’t stop right now, every single one of you will be assigned detention today!” or “The next person who utters even one word will get a zero on this test!” Threats don’t go over well with students and are nearly impossible to enforce as a teacher. Don’t succumb to the ease of idle threats. Instead, pause before making the threat and think of other strategies that might work in the moment. Students should be aware of the teacher’s or the school’s code of conduct. A code of conduct should outline the consequences for specific behaviors in the classroom. If tardiness is the reason you’re losing control of your class, follow the written code of conduct to correct the misbehavior. This shows students there are direct effects for their actions, leaves a paper trail of your decision making, and often triggers an automatic phone call home. Using an already published and readily available list of consequences also eliminates accusations of unfairness or favoritism. When a classroom veers out of control it can often be traced to a few ringleaders who influence the entire class. Those students should be dealt with directly, including all the steps listed above. They should also be given a chance to be a positive member of the classroom. Give them responsibility and go out of your way to compliment positive behaviors. This tells them the consequence that resulted from their poor behavior is not personal and there is ample opportunity to gain attention for the right reasons. The best recipe for classroom management is a good lesson plan. Look inward and ask yourself: Are my lessons stale? Can I find materials that are more engaging? Are the students being asked to be passive or active learners? Trying something different can be daunting because no one likes to experiment with the unknown in an already difficult situation, but it is our professional responsibility to give our students the best chance at success, even if that means changing what has worked in the past. One way to reinvigorate your lessons is to use engaging materials, such as graphic organizers or text analysis worksheets, which are part of Help Teaching’s free printable worksheets collection, to encourage higher level thinking and more active student participation. A difficult class is never a lost cause. Follow these steps to ensure that you’ve exhausted all of your options so you – and your class – have the best chance at success for the entire school year. Read 5 Rules for the First Day of School for more advice on how to create a welcoming classroom.